The appeal of buying shaded, worn looking jeans has never died out. Torn, shredded, and bleached, this is the kind of apparel that seldom goes out of fashion. It’s because newness is boring and clichéd: people want antiquated, worn-in vibes; something that looks aged and rustic—but something that works. It’s the same with kitchens and kitchenware: people love the timeworn aesthetic of vintage décor, and we’ve got just the right things for you. Scales are usually all metal or plastic, flat and uninspiring. How do you go about replacing this item with something that complements your kitchen aesthetic? Here’s the perfect vintage item that you can use to purpose—and a bonus: the perfect deception for your curious visitors! See how a scale on a kitchen shelf adds just the right touch below. Our kitchen clock scale sits on a kitchen counter adding charm. You’re probably familiar with the hanging scales to be found in countryside marketplaces: the kind that has a vessel suspended by chains to a measuring device. 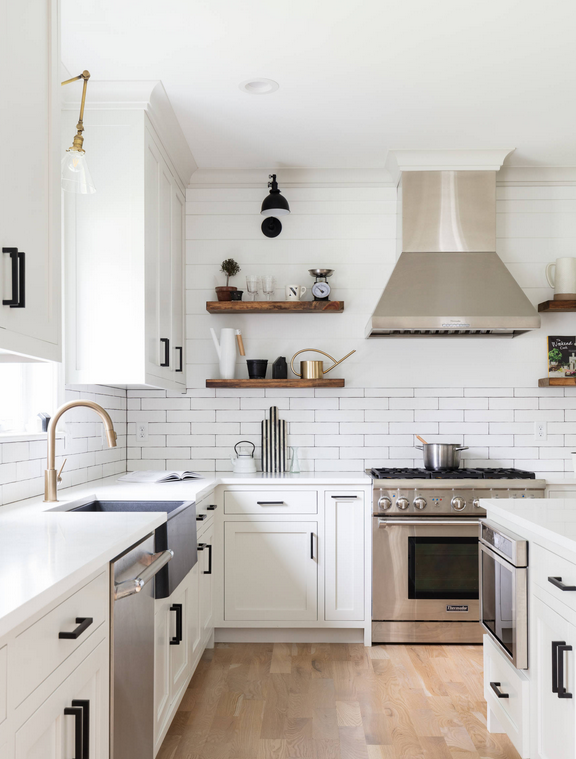 The ones in marketplaces are usually metallic and have a visible sheen to them, and you’re probably looking for something more rusted, more rugged, and more complementary with a bronze and ivory kitchen aesthetic. You don’t want your scale to look too polished, but you want it to stand out just the same. It needs to look aged, but it should also be perfectly suitable for use. Nothing can pull off this countrified and relaxed look like this vintage styled scale clock, rusted just enough, and in just the right places. It comes with a working clock and looks like it has just walked off a rustic farmhouse kitchen from a Thomas Hardy novel. This scale clock perfectly complements any rustic and farmhouse interior and is unique enough for people looking for a more modern farmhouse aesthetic. Your visitors are sure to be awed by this marvel of a kitchen item—not to say you’ll surely stand out! Dainty and Deceitful: A Scale That’s Actually a Clock! If you’re looking for scale clocks that don’t hang, this little grocery scale clock is certain to pull at your heartstrings. 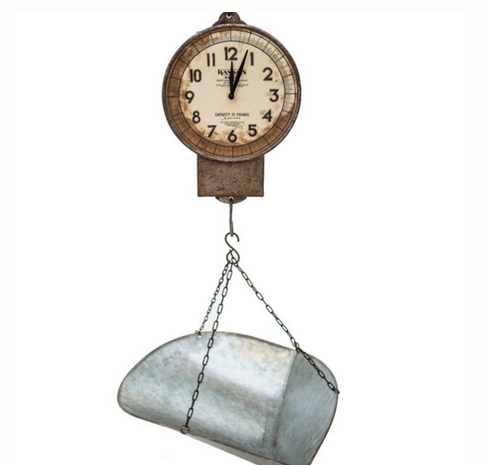 Rusted, vintage, and dainty, this scale clock stands out simply by standing on kitchen counters. Whether on its own or accompanied by a plant, this little beauty gives off the grey, willowy, and rustic look so endearing to modern farmhouse lovers. It works best against a white countertop! If You’re Looking for Something More Colorful. . .
Vintage items aren’t known for being poppy and bold, but there can always be tints of pleasant color in them. You can use this adorable and dainty scale which is both vintage and colorful. Perfectly rustic, it gives off that idyllic farmhouse kitchen vibe instantly. The tiny veggies are in light colors and stand out against the cream background of the scale. Pretty, portable, and in perfect working condition, this scale is captivating and a perfect addition to any rustic kitchen. Browse more farmhouse kitchen accessories for your rustic and modern countrified kitchen in our collection.